Sondra got to leave today. She is at the apartment and I will be putting her on a plane tomorrow. She and I went and ate supper with the other residents of Twice Blessed House this evening. The Junior Service League did the cooking and we got to meet a few other folks there. Dale made two trips around the nurses station today so he is slowly getting stronger. He ate a bit more too. The big excitement of course is the Cowboys/Packers game. Funny thing about life – ordinarily Dale would have it on and be yelling at the tv while I frown about all the noise and end up in the bedroom on the laptop. I’m still on the computer but he could care less about the game and is catnapping. Here is a picture from earlier today, just before I took Sondy to the apartment. They both look good for just having had major surgery don’t they? She will never know just how much this means to all of us. 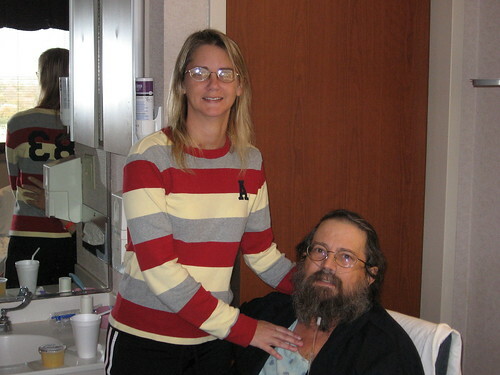 This entry was posted in Faith, Kidney, Personal on November 29, 2007 by Dee.